On 12 September 1978, exactly 40 years ago, the landmark Declaration of Alma-Ata on primary health care was signed at the International Conference on Primary Health Care. The Conference, held in the city of Almaty at the Palace of the Republic, was the first of its kind to commit governments, health and development workers, and the global community to protect and promote the health of the world’s population through a primary health-care approach. On the occasion of this 40th anniversary, the WHO European Centre for Primary Health Care together with national and city officials and representatives of United Nations agencies, development partners, allied universities and professional associations celebrated this important anniversary. The Centre took the opportunity to welcome guests to its offices, hosted at the Kazakh National Medical University, and showcase its work on people-centred primary health care and integrated services delivery in the WHO European Region. 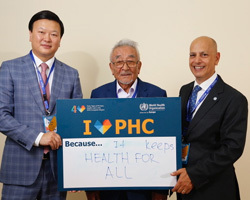 At the celebration, Professor Toregeldy Sharmanov, who was Kazakhstan’s Minister of Health in 1978 and among the core organizers of the International Conference on Primary Health Care, shared memories of the event and his vision of primary health care towards universal health coverage. Representatives from the Ministry of Health joined the celebration to commemorate the occasion. It was organized ahead of primary health care-related events to come, including the Global Conference on Primary Health Care on 25–26 October 2018 in Astana, Kazakhstan. The WHO European Centre for Primary Health Care is a hub of excellence in primary health care and services delivery. It sets out to ensure that WHO/Europe is equipped to work closely with Member States in their efforts to establish people-centred, integrated services delivery. The Centre is composed of a team of public health specialists, health economists, social scientists, data specialists, academics and former clinicians who share the same passion for primary health care and people. The Centre is located in Almaty, the birthplace of primary health care, where the Declaration of Alma-Ata was signed in 1978.